Hands up if you remember all the personalized ‘stuff’ of the 80’s and 90’s? You could get your name on anything from a water bottle and pencil sharpener, to a toothbrush and comb. Well in theory you could, unless your name was Rajveer (or Surijt, or Meena, or Anoop …. you get the point). I still remember spinning that rack round and round and seeing all the ‘pretty names’ like Christina and Julia, but never finding mine. 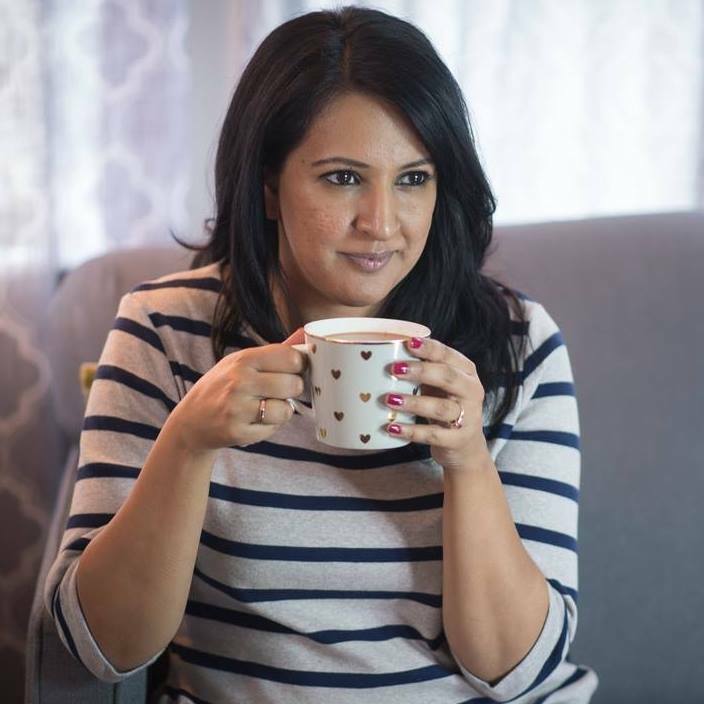 That was in late 80’s and early 90’s, but even in 2009 when I took my kids to Niagra Falls they scoured the shelf filled with personalized mugs and guess what, no Armaan or Zara. As a kid not seeing my name as an option made me feel somehow less than, or unimportant, as an adult who loves personalized gifts, it just bugs me! 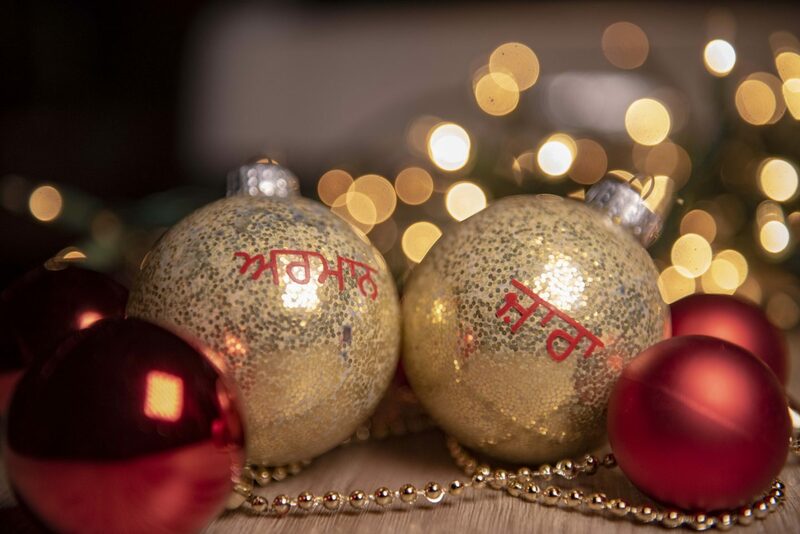 That’s why I decided to do something unique as a gift idea for my mom this year – personalized glitter ornaments with all of her grand kids names written in Punjabi. My mom absolutely loves decorating her Christmas tree, and of course, loves nothing more than her grandchildren. Could there be a better gift. Of course, you could easily do this same DIY by just spelling out your kid’s names in English and that would still be special, but I just love the way Punjabi letters look, and I know the kids will get a kick out of seeing their names spelled out that way. For my project I used the Cricut Maker. I’m pretty new to using the Maker, but I’m already loving it. Their design software (Cricut Design Space) is free and easy to use, printing the projects is pretty simple – I’ve had a few minor struggles but I think it’s a learning curve, and the vinyl transfers so well. In the video below I’m sharing the step-by-step on getting this project done, or you can scroll down for the details. Fill glass ornaments with glue and make sure the entire surface is covered. 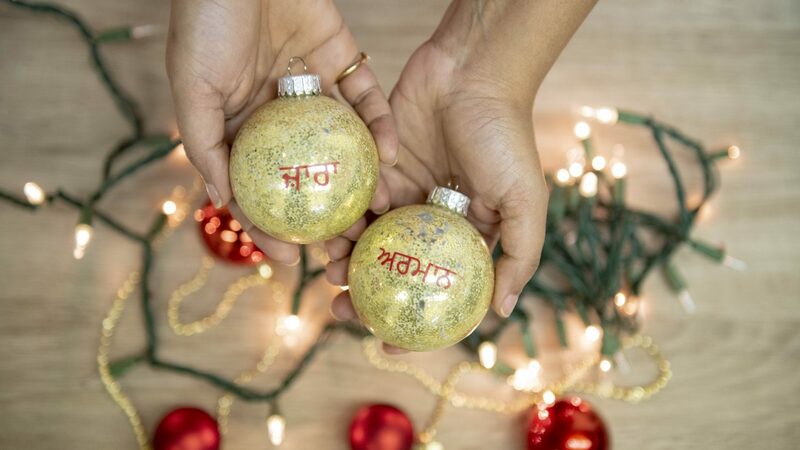 Add glitter to the ornament, put the cap back on and shake. Create a png file with a transparent background featuring the name you want to print in Punjabi. You can either use a font program, or use Google translate and turn a screen grab into a png. Upload the file you’ve created into Cricut Design Space. If you are doing multiple names, lay them out so you can keep the size of the names somewhat similar. Print the names on permanent vinyl using your Cricut Maker. Tip: make sure you press really well before starting to pull the transfer tape off of the vinyl. The rounded shape of the ornaments makes it a bit trickier to get the vinyl to stick down, but if you go slowly it works just fine. Next Post I’m Not Setting Any Goals This Year, How About You?